Natalie Phillips, Ph.D., is a neuropsychologist and Project Director at the Lady Davis Institute for Medical Research. 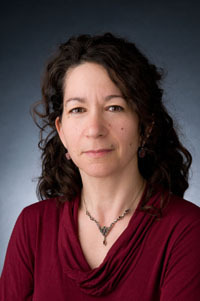 She is an Associate Professor in the Department of Psychology at Concordia University, and a member of the Centre for Research in Human Development and the Centre for Research on Language Mind and Brain. She is cross-appointed to the Department of Clinical Neurosciences in the Jewish General Hospital. She completed her doctorate in clinical psychology at Dalhousie University in 1996. Upon finishing her clinical training in neuropsychology at the Foothills Hospital, Calgary, she joined the Concordia faculty. She teaches in the area of psychological assessment and human neuropsychology and has served as Director of Clinical Training (2008-09; 2010-11). From 2000 to 2005, she held a CIHR New Investigator Award. She runs two nationally funded research laboratories, one at the Loyola Campus of Concordia University and the other in the Department of Clinical Neurosciences, at the Jewish General Hospital, where she examines the neuropsychology of healthy aging and dementia. Dr. Phillips’s research efforts are directed at understanding cognitive changes in aging by studying both healthy older adults and patients with Alzheimer's disease. In healthy older adult populations, she is interested in identifying factors which help (e.g. context) or hinder (e.g. reduced memory capacity) our understanding of language and how these are influenced by age. Current research (funded by the CIHR and the Alzheimer Society of Canada) examines age differences in audio-visual speech processing and the sensory and cognitive factors which predict performance. Other studies investigate executive function and attentional control in older and younger adults. In general, Dr. Phillips employs traditional neuropsychological tests, cognitive psychology methods, and event-related brain potential (ERP) measures to examine age-related differences in on-line language comprehension, inhibition efficiency, and cognitive control. With respect to Alzheimer's disease, Dr. Phillips is attempting to identify electrophysiological (ERP) markers of brain dysfunction that will lead to improved early diagnosis. Recent research, funded by the Alzheimer Society of Canada, examined executive control during task switching in patients with Alzheimer's disease and with mild cognitive impairment (individuals at risk for developing Alzheimer’s disease). Dr. Phillips and her colleagues are examining the extent to which executive and attentional control is impaired in this high-risk group. They are also studying the brain mechanisms underlying this impairment, using ERPs, EEG coherence, and neuroanatomical measures. The team (Drs. Nasreddine, Phillips, and Chertkow) has developed and validated the MoCA (the Montreal Cognitive Assessment), a brief cognitive screening test used in the detection of MCI. Johns, E. K., Phillips, N. A., Belleville, S., Goupil, D., Babins, L., Kelner, N., Ska, B., Gilbert, B., Inglis, G., Panisset, M., de Boysson, C., & Chertkow, H. (2009). Executive functions in frontotemporal dementia and Lewy body dementia. Neuropsychology, 23 (6), 765–777. Nasreddine, Z.S., Phillips, N.A., Bédirian, V., Charbonneau, S., Whitehead, V., Collin, I., Cummings, J.L., and Chertkow, H. (2005). The Montreal Cognitive Assessment (MoCA): A Brief Screening Tool For Mild Cognitive Impairment. Journal of the American Geriatric Society, 53, 695-699. Phillips, N.A., and Lesperance, D.T. (2003). Breaking the waves: Age differences in electrical brain activity when reading text with distractions. Psychology and Aging, 18, 126-139. Dr. Natalie Phillips is a neuropsychologist and an Associate Professor in the Department of Psychology at Concordia University. She is a Project Director at the Lady Davis Institute for Medical Research. From 2000-2005, she held a CIHR New Investigator Award. She runs two nationally-funded research laboratories, one at the Loyola Campus of Concordia University and the other in the Department of Clinical Neurosciences, at the Jewish General Hospital, where she examines the neuropsychology of healthy aging and dementia. She holds funding from the NSERC, the CIHR, and the Alzheimer Society of Canada. She was a mentor in the CIHR Strategic Research Training Program in Communication and Social Interaction in Healthy Aging (2004-2010).